When looking at Clowning Around you'll just say "Wow!" You've never seen a clown Halloween mask like this one! Four incredibly detailed clown faces surround the head of this mask. All four are horrific, scary, evil clowns just waiting for someone to get within reach. No one will know which side you are looking out of. A great Halloween mask! Chuck Jarman, creator of this mask, has done an amazing job. The detail is unbelievable and the paint job is excellent. Looks absolutely scary. 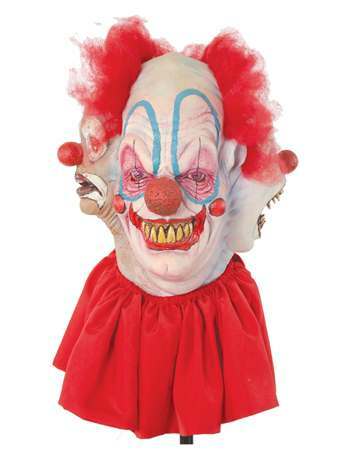 If anyone you know has a fear of clowns...this mask is sure to scare them to death! I love mask, the detail and finish are awesome! Great work Chuck!